Awamori is a type of distilled rice liqueur which originates from the Okinawa Islands. It’s been produced since 500 – 600 years ago when the islands were still independent from Japan and known as the Ryukyu Kingdom. Back then it was mostly consumed by royalty, therefore, the Ryukyu King would regularly send aged awamori as tribute gifts to the rulers of Japan and China. In this awamori guide we will learn how its made, how to drink it and find out more about the various types. 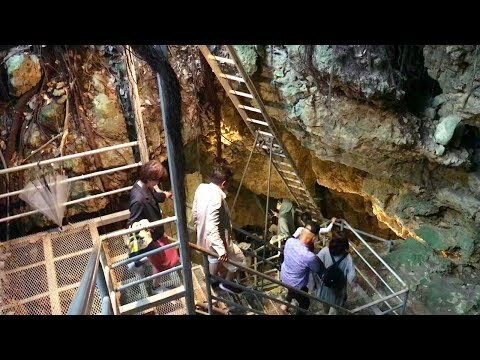 In this video you will see how Okinawan distilleries store their awamori in limestone caves for aging. Interestingly, many private individuals also store their own bottles in these same caves in commemoration of weddings and births. The video is owned and created by Local Topics Japan. Awamori is easy to drink despite its high alcohol content. But fortunately, one is much less likely to experience a hangover because its distilled and contains very few impurities. There are a number of ways one can enjoy this drink. If you ever get the chance to visit the Okinawan Islands and order awamori in a restaurant, it will be served as a set similar to the picture above. The set comes with a bucket of ice and a jug of water so that you can dilute the drink to your liking. It can also be enjoyed as a cocktail, with a tonic, orange juice or even a special coffee flavored milk. The options are almost endless but the traditional way to drink it is clean or on the rocks. The main ingredient is long grain indica rice which is imported from Thailand. Indica is preferred to Japonica rice which is used in sake production because it’s less sticky and yields a higher alcohol percentage. In the first step of awamori production, indica rice gets soaked in water before being steamed. Afterwards, black koji mold gets mixed in with the rice. This particular mold triggers the production of citric acid which acts as a purifier. This is followed by a fermentation process where water and yeast is added which turns the rice into mash, known as moromi. The mash mixture gets transferred to a still when fermentation is complete. The still gets heated by means of fire until the moromi becomes liquidized and then moved to a tank where it gets stored for a certain period of time to mature. As recently as a few years ago if you wanted to sample this beverage you would have to get on a plane and travel to Okinawa. Nowadays, obtaining your own bottle in the US, Europe or even other parts of Asia is becoming increasingly easy thanks to its growing international popularity. It’s even found its way onto many restaurant menu’s. At this stage the variety of awamori brands are still extremely limited in the West but expect this to change in the next few years. There are somewhere around 46 awamori distilleries scattered across the Okinawa Islands which produce hundreds of varieties. Below we will list the three most popular and well known types. Habushu is probably one of the most strangely unique drinks in the world. The yellow colored liquid consists of awamori mixed with honey and herbs – and then the main ingredient, the venomous habushu snake. Don’t worry, it’s safe to drink because the high alcohol content neutralizes the venom. Read more about Okinawan snake wine. Hanazake originates from Yonaguni Island, Okinawa. This particular variety is one of the more expensive types and generally has an above average alcohol percentage. It was originally intended to be consumed during Ryukyu religious ceremonies and tradition calls for it to be enjoyed straight, despite its strong alcohol content. Just like wine, awamori improves the older it gets and needs to be aged for a minimum of 3 years before it gets classified as kusu. The ideal way to age it is by storing it underground in clay containers where the temperatures are consistently cool. Sadly, during the battle of Okinawa countless such containers holding centuries old awamori were destroyed. Also, kusu is very valuable and its therefore common practice to mix it with newer awamori at a 50% ratio in order to preserve older stock. Discover more about the interesting and centuries old distillery process with the Kin Shuzo Distillery Company.